The Finishing Touch of Kentucky is a manufacturer and wholesaler of equestrian jewelry. Horses are our specialty because we live in Lexington, KY, the horse capital of the world, and we love horses! We ship out of our manufacturing facility which is located in Nicholasville, KY. Since 1989, we have offered the finest quality in costume equestrian jewelry, and over the years have grown to become the premier costume jewelry manufacturer in the United States. Although we carry a few items that are imports (maybe 5%), most of our products are designed in Kentucky; we outsource the model making, casting, polishing, and plating in Rhode Island, which was once the costume jewelry capital of the world (before NAFTA became a reality). Rhode Islanders have been designing, casting, soldering, plating, and stoning jewelry since the early 20th century, and they are the best! 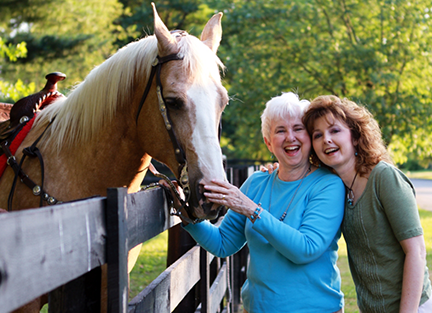 Mary Holman, Founder and Kaye Holder, General Manager make The Finishing Touch of Kentucky a two-generation business. Final touches (such as stones, painting, chains on necklaces, etc.) are added to each piece of the TFT of KY equestrian jewelry by Kentucky artisans at our company headquarters in Kentucky. Through this process, our customers receive the added bonus of a superior product because it is made in the USA where these processes were developed. The designs we manufacture are lead free, and are made with the horse lover in mind. We take such delight in being able to offer you the highest quality and most exciting styles in equestrian jewelry available in the marketplace. When you browse our web store, you will discover a wide range of products including children's horse earrings, pendants, gift sets, stock pins for children and adults, equestrian zipper pulls, horse number sign tack pins, and children's equestrian finger rings. At the other end of the spectrum, you will see the highest quality ladies jewelry designs which incorporate Swarovski crystals and semi-precious stones. We have the largest selection of fine-quality stock pins in the industry, and a wide variety of breeds of horses such a quarter horses, saddlebreds, Arabs, thoroughbreds, mules, donkeys, paso finos, morgans, walking horses and many more disciplines replicated in jewelry designs. The merchandising help we offer our retailers is second to none! We work diligently to help our retailers present to their customers premium-quality products, each item displayed to its optimum advantage on any one of our vast assortments of mechandising units. Please enjoy your time in our web store, and keep in mind, when you buy jewelry at The Finishing Touch of Kentucky, you help to create jobs in the USA. A 34-year-old Kentucky corporation operates The Finishing Touch of Kentucky located in the heart of Kentucky's Bluegrass Region, an area steeped in the tradition of the horse. Our mission is to bring together a collection of equine items geared to making your store an exciting place for your customers to shop; we are diligent in our effort in ensuring products that are more profitable for you and more appealing to your customers. We constantly strive to maintain the most up-to-date looks and original designs, adding new items each season to our extensive inventory. Our priority is to make it easy for you to order and reorder our products. To accomplish this, we produce a new catalog every two years with supplements each spring and fall; we provide a shopping cart website at www.tftofky.com which is the most up-to-date resource for viewing products and pricing from The Finishing Touch of Kentucky. Also available to each of our customers upon their request, is an e-newsletter which offers pricing specials, coupons, and other valuable amenities. As our customer, you have at your fingertips a toll-free number as well as fax and e-mail service. In addition, we display our products at trade markets in the spring and fall around the country should you desire to see first hand the many lovely designs offered. We have sales representation in Canada, in the Midwest and in the states bordering the East and West coast United States. If you would like a sales rep to call on you, please call us at 1-800-962-8656 and ask to speak with someone in sales. The merchandising from The Finishing Touch of Kentucky has "pull-through" which gives you the opportunity to average four to six turns per year when you maintain a good selection of product and continually reorder. Our Company is based on Biblical principles, and we are dedicated to those principles. We pray frequently for our customers generally, and on occasion we pray specifically when they let their needs be known. If you would like us to pray for a specific need, please don't hesitate to call with your request. We take a great deal of pride in offering a high-quality product at the lowest possible price, and we stand behind the products that we sell. The items pictured on this website are costume jewelry and are plated in durable karat gold or imitation rhodium (gives a nice silver finish without the problem of tarnishing) over white metal or brass. Jewelry from The Finishing Touch of Kentucky withstands the test of time when cared for properly. 9am-5pm EST, Monday through Friday and by appointment.